Would you like to bring your electric bike with you on holiday? Or take a tour with your E-bike outside of your usual route? It’s all possible with a bike carrier on your towbar! However, when transporting your E-bike, things such as maximum nose weight and the necessary laws and regulations come into play. We will be pleased to help you. 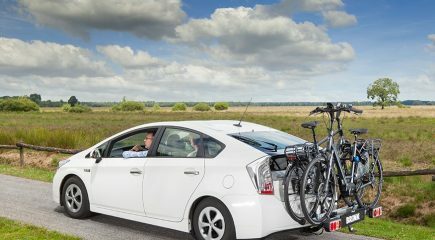 Transporting E-bikes with a bike carrier on your towbar has proven popular. 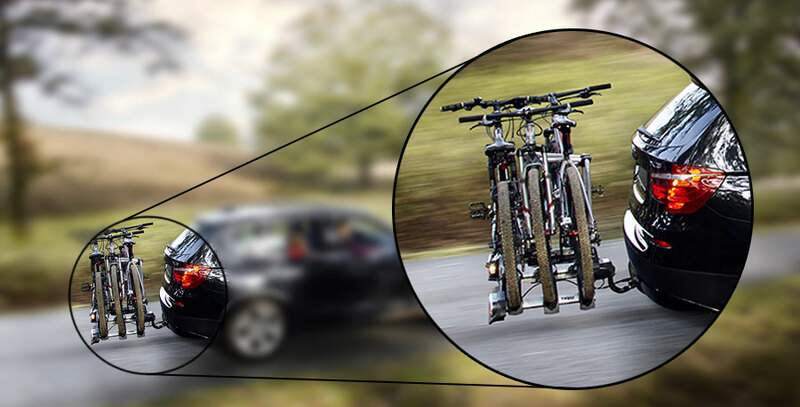 A towbar is strong, is mounted at a practical height, offers stability and has a carrying capacity that generally can take the weight of two E-bikes. As the word ‘generally’ suggests, it is not a given that you can load your E-bikes on every bike carrier. This all has to do with the maximum nose weight of the towbar that has been mounted on your car. In more simple terms: you can load your towbar up to a maximum weight, as determined by the manufacturer of your car. The maximum nose weight is usually listed on the plate next to the socket of your towbar. If not, you can usually find it in your car’s papers, or request the information from a brand dealership. This maximum nose weight differs per car, but usually lies between 45 kg in small cars and 75 kg in larger car models. A nose weight that exceeds the maximum limit due to excess weight results in undue taxation of the car’s suspension and towbar mount. In addition, it negatively influences the driving capabilities and power steering. If you want to transport a bike carrier with E-bikes on your towbar, you will have to know the total weight of your electric bikes plus that of your bike carrier. The weight of your bike carrier and electric bikes can be found in the product description of the manufacturer. On average, the weight of an electric bike is about 6 kg more than a normal bike. This difference can mostly be explained by the added battery pack and motor. An E-bike battery pack weighs about 3 kg. There will be some weight difference, depending on the different types. Many E-bikes have been equipped with a removable battery. You can remove it from the bike, making it lighter.Very practical when lifting the bike and beneficial for the total weight. A regular bike carrier has been designed for bikes with a weight of about 22 kg per bike and the total weight may not exceed 50 kilos. Considering the fact that the electric bike is a lot heavier and the additional weight (such as the battery) is mostly located at the top, greater forces will be exerted upon the bike carrier, at the point where it is attached to your towbar. We therefore recommend purchasing a bike carrier that has been specially designed to transport electric bikes, and which has been certified for 30 kg per bike. This already makes clear that it is not possible to transport multiple electric bikes on the towbar of small cars. Another option would then be a bike carrier on the roof of your car. The following carriers are extremely suitable for transporting electric bikes on your towbar: Spinder Compact, Pro User Diamant, Thule Europower 916, Thule Easyfold 931 and the Uebler X21 Nano. As electric bikes are generally very heavy, making it harder to lift them onto the bike carrier, some bike carriers are equipped with special ramps that make it easier to load them. When it comes to design, these bike carriers are increasingly shaped like an extension of your car. And the most important: the manufacturers have taken the maximum nose weight into consideration and managed to significantly lower the weight of the carrier. Even if you have found the right combination of E-bikes and bike carriers to match the maximum nose weight of your towbar, there’s still more to be done. You will also have to meet several requirements set forth in laws and regulations before you can hit the road with your bikes. According to Dutch law, it is not allowed for bikes to extend more than 20 centimetres beyond each side of the car. No sharp edges should stick out. A white licence plate should be attached to the bike carrier.